So, I LOVE Pinterest…I mean, I rarely watch TV anymore! I loved getting all cosy in my bed and looking at the latest pins before I go to sleep…yes, I dim the screen big time so I don’t disturb Jason! I’m loving all of the awesome veggies dishes online and I’ve been pinning a lot of them lately. During the fall when I was working at slimming down, I really started loving my veggies again! You can check out my Pinterest Vegetable Board here. Summer is all about barbecuing and what easier way to entertain than to roast some veggies, make a fresh salad and throw some steaks on the barbie! Done and virtually no stress! I found a recipe on Pinterest for Moroccan Spiced Roasted Sweet Potatoes and Carrots from Gourmande in the Kitchen (click here). I’m still trying to eat as low carb as possible, so I skipped the sweet potatoes and used only carrots. I’ve made it with the peeled prepackaged carrots from Costco that still have the green tops on and I’ve also used fresh bunched carrots. I just washed them well and left a bit of the greens on top. I would not recommend using the peeled baby carrots that you see in stores as these just don’t taste as fresh. These carrots are seriously so good that I’ve eaten the leftovers cold from the fridge! 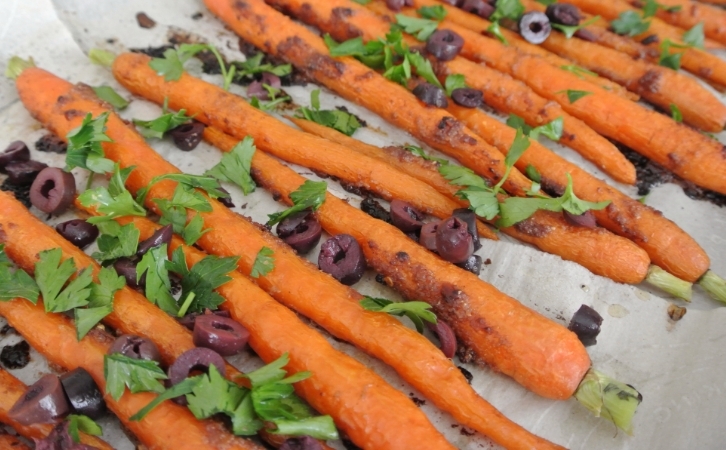 The flavors are amazing….the coconut and cinnamon work so well with the carrots. 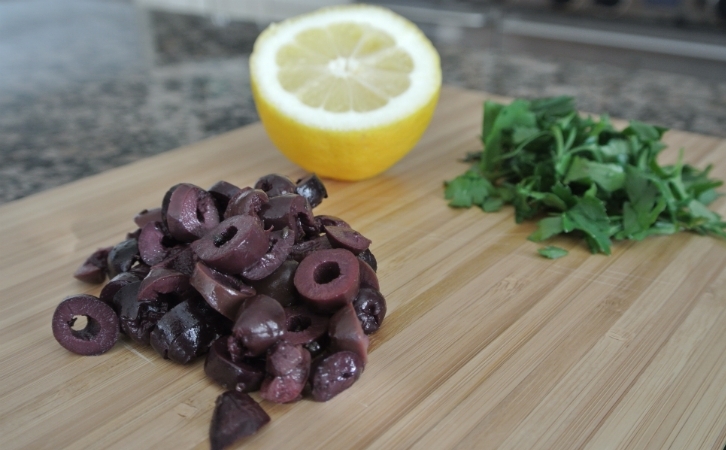 And the olives add a layer of saltiness! The other great thing about these carrots are they are gluten free, vegan and work with the paleo diet! Using super fresh carrots is best for this recipe. Give them a good wash, slightly trim the ends and leave a bit of the greens on top. Place on a parchment lined cookie sheet. Melt the coconut oil in a small saucepan over medium heat and whisk in the salt, spices and garlic. Toss the carrots with oil and spices and roast on a parchment lined cookie sheet (with sides) in lower third of oven for 30 minutes or until lightly browned and tender. I just put the coconut oil, spices and garlic in a saucepan at the same time and whisked it over medium heat. Your house will smell amazing! Spoon the mixture over the carrots and toss. Not only is this garnish colorful, but the flavors add the perfect finishing balance to the spiced carrots. This recipe is definitely entertaining-worthy and prep time is minimal!! Enjoy! « Friday Find ~ iPhone and Credit Card Case!